Ottavio Gesmundo, Ottavio Canestrelli’s grandson, hails from more than six generations of Italian circus performers. He is a director, choreographer, and stunt coordinator, who has performed on numerous television specials, Broadway, and over twenty-five productions in Las Vegas. Currently, Ottavio travels the globe performing death-defying crossbow stunts with his wife, Naomi, as MR. & MRS. G. Gesmundo lives in Las Vegas, Nevada. The Grand Gypsy: A Memoir is the enchanting story of Ottavio Canestrelli, an Italian circus performer. Born into a circus family several generations long, Canestrelli was raised under a makeshift big-top, performing alongside his family members and a colorful menagerie. As an adult, he traveled the world, both as a performer and while in the army. He shares his stories of growing up in a circus, living and fighting through both World Wars, crossing paths with grand historical figures like Gandhi, and carrying on the legacy of the Canestrelli Circus. After Canestrelli passed away, his grandson, Ottavio Gesmundo, polished and published his grandfather’s memoir, honoring the man he knew as The Grand Gypsy. This book opens with a quote by author, historian, and editor, Dominique Jando: “Artists from old Italian circus families are the keepers of a precious wealth of historical knowledge.” That alone sums up Ottavio Canestrelli’s memoir perfectly. His words are, quite simply, precious. His life experiences and unique voice in sharing them help shed a new light on one of the most fascinating and tumultuous eras in history. 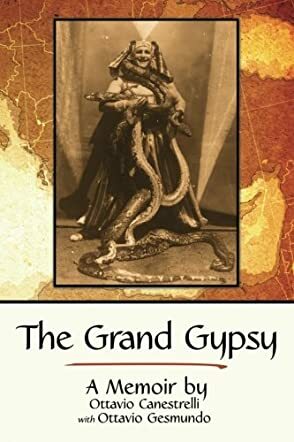 Peppered with additional text from his grandson, Gesmundo, and a plethora of captivating historical photographs, The Grand Gypsy is an outstanding literary experience from beginning to end. The Grand Gypsy is equal parts an entertaining portrait of circus life, a war drama, a heartwarming snapshot of family life, and a thrilling memoir. By the end of the book, Ottavio and the Canestrelli family feel welcome and familiar, as if all who read The Grand Gypsy: A Memoir are now truly a part of the Canestrelli legacy, too. "The Grand Gypsy” was published on June 9, 2016 and is on sale both as a paperback and eBook through Lulu.com and should also be available from Amazon, AppleBooks, Kobo, and Ingram, with worldwide distribution. A paperback book, six inches wide and nine tall, it has 238 pages and is published in English. The list price is $18.98 and the book is well-illustrated in black and white photos, over 170 in fact, and can be obtained at www.thegrandgypsy.com. Historian and author Dominique Jando comments on the uniqueness of this particular book, the life story of an Italian Circus performer, Ottavio Canestrelli and that in his lifetime he was able to document all the fascinating phases of his life for himself, not through a ghost writer. He began his memoirs in 1970 and died in Sarasota, Florida in November 1977, aged 81. Now his grandson, Ottavio Gesmundo (a son of the bounding rope artiste La Tosca Canestrelli who appeared in London with Bertram Mills Circus over sixty years ago) has published Canestrelli’s fascinating story. His grandfather’s memoirs are italicized throughout the book, but Gesmundo has added some explanatory commentary on relevant events that were omitted from the original manuscript, and has expanded on some aspects of the story. Canestrelli was born June 10, 1896 at his father’s circus, and travelled the world as a circus performer, became a decorated World War I veteran, and impresario and multitalented showman, his last contribution to circus history being his celebrated chimpanzee act, Mr. Coco and Company, the chimps dressed as US soldiers, Ottavio as a Bilko-esque sergeant. The story of his travels, his acts and those of his talented family will enthrall any reader, and this is a most well-written and structured book on the life of “The Grandest of Gypsies”. I recommend it whole-heartedly, being Ottavio Gesmundo the co-writer who brought the book to fruition, and Ottavio’s grandson, comes from more than six generations of the family and lives in Las Vegas. He has appeared in over 25 Las Vegas productions as a dancer, singer actor, and stuntman, including in “A Chorus Line” at the Sahara, “Lido de Paris” at the Stardust, and in “EFX” at the MGM Grand Hotel with Michael Crawford, David Cassidy, and Tommy Tune. He’s appeared in “Saturday Night Fever” on Broadway, Elton John's and Tim Rice’s musical “Aida” and in Spider-Man Live!”. In addition to performing, he is a choreographer and director in circus and theatrical productions and with his wife Naomi, performs around the world his crossbow marksmanship act as “Mr. and Mrs. G”. In him and a host of others in the Canestrelli clan, the future of the Canestrellis in show business is assured. Do try and obtain a copy of this mesmerizing book! Available from publisher <www.lulu.com> as well as Amazon and other sources. ISBN: 9781483448947, published June, 2016.